and the eternal art of good circuit design. This story all begins with Julius Futterman. Born 13th October 1907 in New York, as a descendant of German immigrants. Died 12th September 1981 in New York. To my opinion he was the last person adding a new amplifier circuit topology to thermionic history. I can not find any information about who invented the single ended (SE) amplifier, but for sure that was befor the push pull (PP) amplifier. In Telephony they build SE amplifiers without tubes (yes!) by putting a variable resistor microphone in series with a voltage source, and send the AC signal you get that way, to a step up transformer. This can give remarkable AC signal, and power gain from something simple like a carbon microphone. A distance of 3000km could be overcome without using tubes. To deal with distortion, a man named W.W.Dean set up this microphone amplifier circuit in a PP configuration and was granted a patent in 1895. And then ever since, no new amplifier circuit was added until 1953, when Julius Futterman patented the OTL circuit, under the file number US2773136A. The word OTL means: Output Transformer Less. 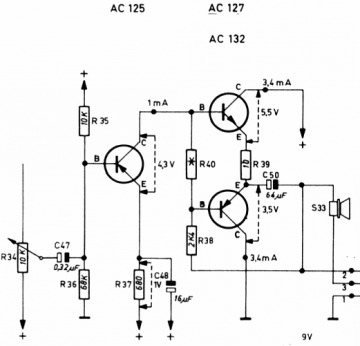 So, a tube amplifier without output transformer. After reading his patent, I thought is quite interesting to quote here, what Julius said himself was so nice about it. First, of course there is no need any more for an output transformer. Next thing he wrote, the topology allowed for more than 60dB feedback without instability. As the tubes (for AC) act like push pull, he also patented a new method to drive those, along with the OTL patent. His OTL topology is exceptional insensitive to power supply hum, thus also eliminating the need for power supply chokes, and other filtering elements, as Julius writes in his patent. About the tubes he used. After his military service, he worked as a designer in a tube tester company, so he had access to many tubes, and he knew what were the real good ones. The manufacturers would just send him anything when he asked for it. There is no real meaning in this story, without knowing how and why he choose those TV flyback tubes, to build an audio amplifier without output transformer. I say this, because what he did may seem obvious today, but the less obvious part is, inventing this new topology, and get even a patent on it. Also, I have to say this, some particular people that only copy other people's work, have tried to re-build modified versions his amplifiers, but were never commercially successful with it. The many OTL you hear about today, are not Futterman designs, but plain cathode followers, which by the definition work transformer less too, but have little to do with Julius' invention. Later, this circuits was also used with Germanium transistors. Philips hat a special transistor matched pair, AC127K, AC32K for that special application only. This circuit is a easier to understand perhaps, than Julius' tube equivalent, but it does the same. You can see straight away, the transistors are in series for DC. Given that the power supply, and the coupling capacitor, are a short for AC signals, you can actually try to pencil this into the schematic. Then you will see the lower transistor feeds directly the speaker, and you will see that both transistor are in parallel, when you replace the power supply by a short (which is so for AC). Only the resistor R39 is in between, but it is neglectable for AC signal. So indeed for AC, the transistors are in parallel. If you recognise this, you understood what Julius was doing. Just he was doing this with tubes, and he got a patent on it, in 1953. Now you know of course, when two resistors are in parallel, you get half the impedance. That's why he did this. His first design used 6 tubes for one channel, which in the end were all in parallel for AC. So, the Futterman Design has the tubes in series (in groups of two) for DC, whereas they are all in parallel for AC. That is so interesting about it. So for signal they could do a lot of work, and bias would be not so excessive. His OTL circuit diagram uses typically TV fly back tubes, which were called 'switching' tubes by Television design engineers, as they will reset the fly back oscillator at the end of each saw-tooth cycle. So the magnetic energy of the oscillator transformer gets destroyed in the tube. They were also called line transformer tubes. Not because of an audio 'line out transformer' but because the saw tooth oscillator was used to drive the magnetic deflection coils, this producing the horizontal 'lines' of the picture tube. For those who remember, they were into that metal 'cage' inside the TV, where all that heat come out from behind of the TV. When you ever serviced tube TV's (as I did...) you will know how amazingly hot those tubes could get, and still wouldn't last any shorter as all the other tubes. So Julius Futterman just used just those tubes for Audio. The Futterman amp works with 4 or 6 tubes per channel, and yet due to it's high efficiency produced a lot of output power at low impedance. Such fly back tubes are by nature high voltage tubes, and still capable of 1.6 Ampere (yes!) anode current too. Which is in tube land a very exceptional situation. So tubes are either normally made for high voltage or for high current. Not so with fly back tubes, so that's why he took them. The efficiency of the later Futterman amplifiers was, and still is unreached by any of those simple cathode follower amplifiers, made today by many of his followers. Due to their low output impedance, and well controlled output signal, the Futterman's were really good at driving loudspeakers with a difficult behavior, like such that have an impedance changing very much vs frequency. Julius wrote some articles about his OTL in military magazines, and that was how Ted Hammond became interested in them, but he never did something with it. Julius never made a big hype around his amplifiers. Many years he build them one by one, in his apartment in New York, where he lived with his wife. Buyers had to show up in person, had to pay 20% in advance, and wait two years for delivery. He was cooking the mains transformers with shellac, using an old pressure pot of the kitchen. These were made in kind of a DIY way, and they looked just like that. He sold those for a brief period under the brand 'Harvard Electronics' and the model was H3, which name he chose because H3 was the number of his apartment. He used whatever materials or tubes he what have at hand, with 4 or 6 tubes per channel. You need to know, these Amplifiers were writing history, and they are interesting collector's pieces now for sure. Information I have is not consistent. First, there is the information in Harvey Rosenberg's book about how he took over the business of Julius. However there is little information about how things went on with Julius afterwards. According to Harvey Rosenberg, as he took over Julius company, it was when Julius memory started to fade, and he writes he could get all things on paper just in time, before Julius finally lost all memory about his projects. So this is just in Harvey's book. I have many reasons and examples, to believe this was not so. Such dramatically fast progressing memory loss, as described by Harvey Rosenberg, means such people need daily care in a home. I believe not a word of this. Julius died in 1981, look further below here, what text he writes still in 1979. Alzheimer will not develop that fast, that somenbody writes sich highly intelligent text in 1979, and then get totally senile in just 15 months or so. This is simply impossible. This situation is also described in a German article, of which to my opinion the contents are not real. It seems to me, this writer copied the memory loss issue from Harvey's book. But there is more, proving Julius was not senile at all. 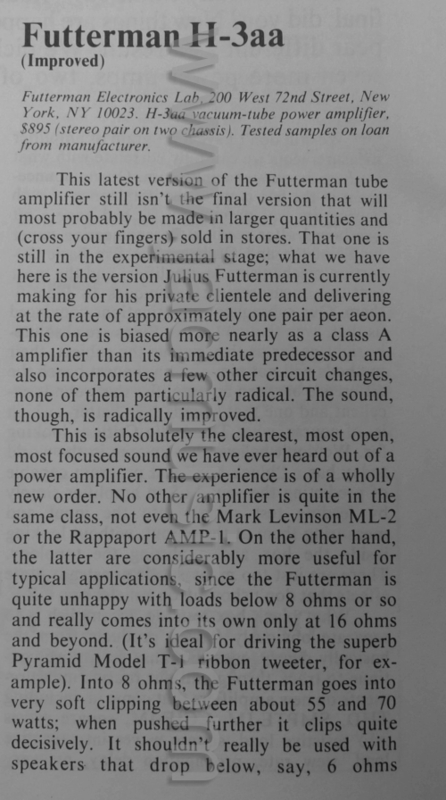 I was surprised to see an Ebay listing of a Futterman amplifier by the first owner, with lots of information about Julius himself. This was documented with pictures of everything, including personal hand writing of Julius, to the owner of this amplifier. I have saved pictures of all of this, just ask me when you are interested. In there, is a hand written letter of Julius, confirming the he accepted 100$ down payment for the H3aa amplifier, in Dec 1979, and it was now finished. This letter is dated April 28th. 1981. The amplifiers was picked up then in July 1981. This is documented information. The death of Julius is (said to be) on September 12th 1981, in New York. So just weeks before he died, he delivered an ready build amplifier. The handwriting of Julius at April 1981, appears fully normal to me, and from the contents of his letter, it is clear he knows exactly what he is doing. So you see something is wrong with that German article in the internet. Not with Julius. This story in there, of Julius ending up senile, seems faked or copied from the wrong source, and when such a dramatic situation is just untrue, I have little t belief in the whole rest of what is written there as well. For copyright reasons I will not be detailed here, but Google for this article, and you won't need to look very long. Delivery was very long, but Julius had reputation for that, and after all he was 77 years old by that time. Julius had a lot of his amplifiers build, via licensing, and he was quite generous with licenses. So you can see a small quantity of amplifiers from before 1982 hand made by himself, during the 20 years when he did so. At one per month we talk about 240 pieces, but I doubt it were ever that much. Realistically speaking, it must have been less than 100 pcs, and the rest was build via licensing companies. Today, some HiFi companies dedicate their 'work' to Julius, by taking advantage of his reputation, in replacement for their own, which is obviously less attractive. A more professional cooperation was with NYAL. 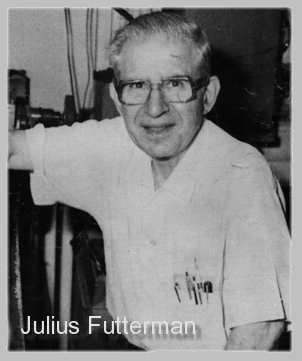 After the death of Julius Futterman in 1981, his products continued to live, via the company New York Audio Labs, owned by Harvey Rosenberg. I think this was a much better way for Julius. Harvey bought all rights of Julius work and picked up production quickly in 1982. This was easy to do, as all he needed to do, was place the printed circuit boards of the H3aa in 19 Inch racks, and there you are: The OTL1 was born. Harvey teamed up with brilliant engineers like Jon Syder, Ted Hammond and George Kaye. 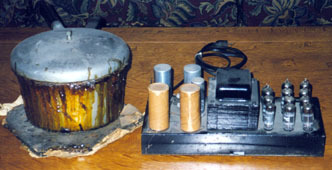 The OTL1 featured a regulated power supply, vs. the unregulated supply of the original H3aa. 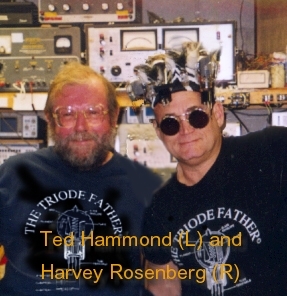 Because of Ted's interest in OTL, Harvey Rosenberg and Ted Hammond found each other and teamed up. 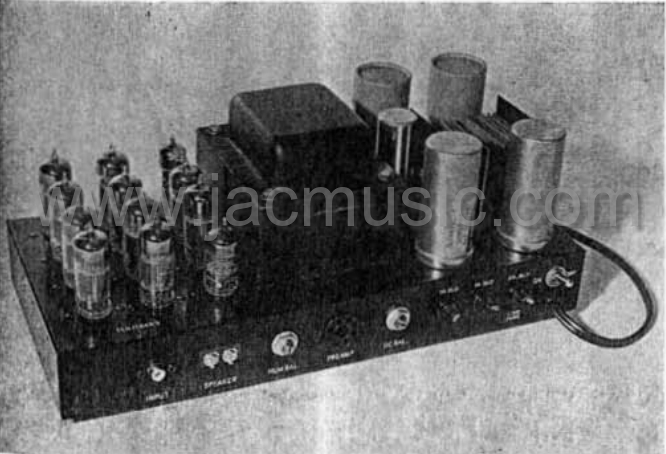 Harvey's company New York Audio Labs (NYAL) was the first to build OTL amplifiers for HiFi. Harvey send me a signed copy of his book, which book has an honored place in my collection, and he gave me also the friendly permission to use the information of his website and parts and of his book, to use here on my website. Ted Hammond died in 2016, and George Kaye still runs a company, servicing Futterman amplifiers. I do not know how many of the NYAL OTL's were made, but I think it were not very many. Prices were too high. They brought the company to the stock market. And then came 'black Friday'. This ruined their stock price, and financially this meant the end of NYAL, just a few years after it began. If you are interested in the history of High Fidelity in OTL amps,聽I recommend Harvey's book 'The search for musical ecstacy'. About Harvey Rosenberg and the Audio Asylum web site. Dr. Harvey Rosenberg got caught in a battle on www.audioasylum.com. This may seem a nice forum to you, but I have my own ideas bout this. The problem is caused by hidden groups of people, and several of them are moderators. The people in such invisible groups back each other up. You can't notice that, but it creates friction if somebody does not do as they say. Moreover there is a hidden commercial interest of the sponsors, meaning when you do not sponsor AA, everybody can say about you, whatever they like, because of freedom of speech. However when you are a sponsor there, you can freely attack non-sponsors or just everybody, and moderators back this up, by deleting replies, or adding their own talk. So in case you try to find the 'truth' in he world of HiFi, it is hard, but Audio Asylum is corrupt, and really not the right place for that. Harvey Rosenberg had a lots of posts there, and they never liked him anyway, because he had quite an opinion of his own, and a professional background. That seems to be a red flag there. Then, one day Harvey stumbled over some items he couldn't defend against a group of inmates. He found his threads messed up with primitive and dishonest writing. For many forum readers, the fun part is, when people feel wronged you can see them struggling. Which was not so hard with Harvey, because he was very emotional, a single player, a very straight forward New Yorker. To my personal opinion, the way the moderators let this go on, was a real shame of this forum. I noticed Harvey writing very long, very emotional replies to each and every insult, and all he received was more laughter. He wrote every evening many very long replies. I never saw him so emotional. During that period, he died of a heart attack, in an airplane. So the discussion had an open end this way. I saw this happening on the forum. He was actually just testing the VAIC reference amplifier at that moment, equipped with the new 52B that was made under the VAIC brand. Our company Jacmusic.com was a sponsor for AA for a while, but after I saw this happening, we stopped with it. I want聽to put up front here Harvey's truly unique, and outstanding contribution to the history of OTL amps.聽He was a friend of Julius Futterman, who spend most of his life improving just one electronic circuit: The OTL.聽Julius Futterman was the inventor of the OTL amplifier, and patented it, the way it is still used today.聽When Julius got older, his memory started to fade (Note by Jac: This was so, according to Harvey Rosenberg, but I have different information from family of Julius). I further quote what Harvey told me: There were piles of unsorted information and lab notes. Harvey was there in time, and was given everything Julius had about his OTL projects. Together with Julius and his friends,聽like Jon Syder, Harvey took these OTL design into production,聽with a new founded company:聽New York Audio Labs.聽(N.Y.A.L. ).聽This, and a lot more, was Harvey Rosenberg.聽These amplifiers are purest craftsmanship of a kind, that had nothing, absolutely nothing, to do with all these 'me too' OTL designs using 6C33 as a cathode follower, or ECL86 headphone OTLs, which was a Philips design anyway. These amps by NYAL were the real masterpieces, of how to really make good tube amps.聽The special TV-Flyback tubes for those are very hard to find nowadays. You do need precisely matched sets of minimum 6 pcs. Adjustment needs deep understanding of how this works, and you can not learn this by doing, otherwise you will be burning out tube grids and fuses. However the last former designer of NYAL, George Kaye is still active, and perhaps can help you with repair service. I have copied what comes next, from聽Harvey's website with his friendly permission. There are two people who brought us the OTL Amplifier. The first of course, it was the patent holder, Julius Futterman. The second was Harvey Rosenberg, who started the first commercial OTL production, with the help of Julius Futterman. For the rest, there are no inventors of the OTL circuit. And sure that is not one particular German company claiming to have known Julius ever since, and getting break through ideas from this visit. If you are interested, you should read the book by Harvey Rosenberg, it describes the birth of the OTL circuit by somebody who was there when it happened. This book describes a piece of OTL HiFi history. 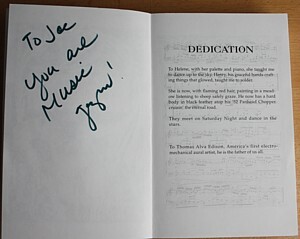 The book still can be bought from a relative, who hosts a copy of his website until today. (Website is here). I still have a complete copy of the original site, and Harvey's written permission to use ut, so it case this copy disappears, let's see what we can do against it. actually I do not know all about this, but here is what I found out. When you have more information, please let me know, I will be glad to place it here! Earlier designs, call it H1, show amplifiers with 12B4A noval tubes. The H3 has a silk screen with 6HJ5 on it, which is a non-top cap tube. However original (looking?) drilling has a through holes for a top cap cables, and 6FL6 was used, which was Julius' favorite tube obviously. Some say, other tubes MAY have been used, but 6FL6 was unbeatable low cost in the days of tube Television. 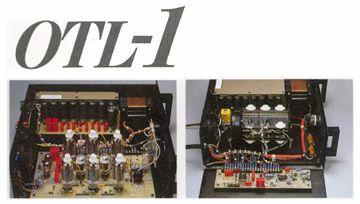 The later NYAL amplifiers were equipped with 6FL6 as well. George Kaye, who still services NYAL and Futterman amplifiers today, says EL509 is a better choice, but it needs some modification. This tube is not cheap, but at least available from JJ new production. Sure is, all Futterman's are collectors items now, and for price development, modifications are typical what you should not do. Several products . 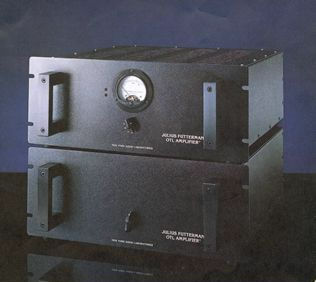 The pictured amplifier works with 8x 12B4, a VERTICAL deflection tube for TV picture tubes. At the chassis side, it was quite empty. Most of it was wiring and a few coupling capacitors. Power Output: 10 Watt into 16 Ohms, @ 0.1% distortion. Low frequency response: 5Hz at 0dB. H3 was the 'big' Futterman, and a breakthrough. It is said he choose H3 because it was the number of his Apartment in New York. The H3 could be build with 4 or 6 tubes per channel. Several output tube types have been used. Silk screen on the amplifier may have been for older 6HJ5, and the amplifier made and wired for 6LF6. Made in Licence by Tech Corporation, and Harvard Electronics. Improved behavior with Electrostats. Made in Licence by Harvard Electronics until early 60's. These had a printed circuit board. Dual Mono Version of the H3a. I have pictures if what is probably the last one Julius made, and it looks like a preliminary version to me. It has plastic stickers on the deck plate, instead of screen printing. Though it doesn't need much of development, as it's just two H3a boards in one chassis. So electronics should be best as can be. Note, terse is 60dB (!) negative feedback in all Futterman OTL. So output impedance is very low by itself anyway, but just feedback can't get that going any more above a certain voltage swing, and then impedance goes up, and that limits the output power at that point. With 6 tubes in parallel, the point where this happens is much further out, so total output with 6 tubes is more than 2x the output of 3 tubes. I never found any correct number... Please let me know when you have some. Please first read this interesting test above, in 'The Audio Critic'. The writer has a comment about the feedback method in this amplifier, and also about future unavailability of the 6LF6 tubes. Then read the comment on that, by Julius Futterman. 1979 Letter by Julius Futterman,to the Editor. 1. The power tubes I use (6LF6) are being manufactured in the USA by GE and Sylvania. They are also being made in Japan and Yugoslavia. I have been informed that they will be around for many years. In your Vol. 1, No. 3 issue, page 4, you wrote that the Berning hybrid tube amplifier using 6LF6 tubes will be manufactured by Audionics. Also please note: The Acoustat X ($2.200) uses 6HB5 tubes, which is also a TV tube. This tube was used in my H-3 stereo amplifier in the 1960's. The Beveridge 2SW-1 ($7.000) uses 40KD6 tubes, also a TV tube. My point is at these two types are of even older vintage than the 6LF6 tube, yet you did not caution a buyer of the Beveridge system about their not being able to obtain them in a few years. I am sure if tubes do a better job in an amp or pre amp they will always be available from one source or another. 2. Before taking up the second subject that makes me unhappy I would like to digress for a minute, if I may. Before transistor amplifiers the rated impedance of most high fidelity speakers was 16 ohms. In Britain practically all speakers were 15 ohms. There were sound reasons for this as, all other things being equal, a higher impedance speaker is more efficient and the crossover design is not as complex. We are referring, of course, to moving-coil speakers. 3. The reason for the lower impedance of speakers today is, of course, the fact that transistor amplifiers, being voltage limited, provide more power for such speakers. As an interesting aside you implied in your review of the Tangent RS2 (Vol. 1, No. 5, page 25) that it was an inefficient speaker as you were able to make the Levinson ML-2 clip on it with a master tape of piano music. On the other hand, I can make the Tangent RS2 play very loud with the H-3aa. The reason for this is simple : The impedance of the RS2 at 70 Hz, for example, is 11.5 ohms; at 500 to 2000 Hz it is 9 ohms, and it rises steadily to over 20 ohms at 6 kHz, which is well above the fundamental tones of the piano. With the ML-2's 14 volt maximum voltage rating you can see that there is very little power to drive the Tangent. End of digression. 4. Electrostatic speakers are inherently of high impedance and this is lowered by means of a transformer. The Acoustat and Beveridge speakers use a different approach. They do not use a transformer; instead they employ very high voltage amplifiers to drive the speakers directly. The KLH-9, Quad, and Koss are examples of speakers using transformers. In general, the lower the turns ratio of the transformer the better the speaker because of tighter coupling and other factors that 1 will not go into here. 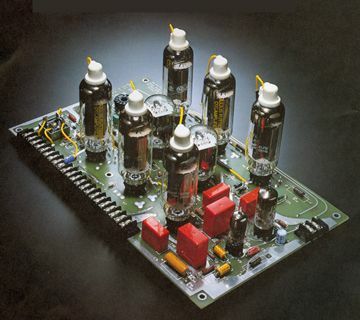 The KLH-9 impedance is 16 ohms, the Quad 15 ohms and the Koss 4 ohms The KLH 9 and Quad were designed for tube amplifiers, the Koss for solid state. It was unquestionably a miscarriage of justice that your amplifier was singled out for our general caveat about the future of vacuum-tube audio equipment. What's true of one particular design is true of them all: their longevity depends on the TV replacement market, the Russian aerospace industry and other factors outside the world of audio. We seriously doubt whether audio manufacturers by themselves could keep even a single vacuum tube factory in business through the 1980's. On the other hand, you may be quite right insofar as these other demands may preserve vacuum tubes from extinction for decades to come. Your guess is as good as ours or anyone else's. The rest of your comments all point to an implicit conclusion we have shared for quite some time, namely that the power amplifier and the loudspeaker should be conceived and designed as a single system, the "back end" of the audio chain, not as two separate all purpose modules that never quite mate optimally. The trouble is that very few audio designers have an equal mastery of both disciplines. For example, neither the Acoustat nor the Beveridge amplifier is as highly refined as yours, although their philosophy of integrated design is certainly valid. -Ed. 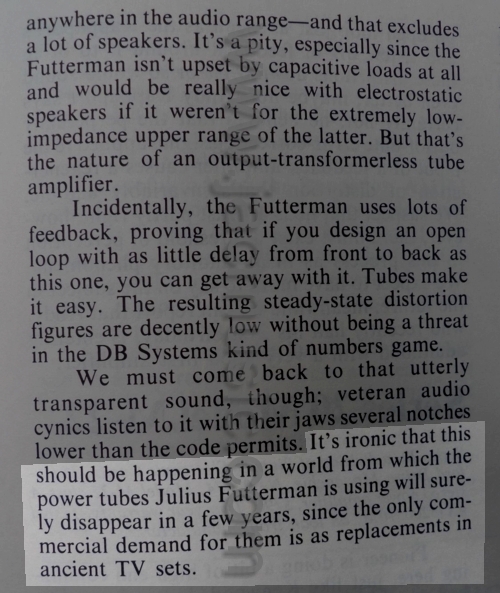 Note by Jac about the use of 6LF6: Audio Critic makes a guess in 1979, about why TV tubes used by Futterman will soon become unavailable, and they write audio manufacturers can not keep one single tube factory alive. Well, there is really a fundamental mistake in the reasoning of Audio Critic, and that is not because they could not know about tube HiFi being so popular now. It is rather not doing the math right. Tubes like 6FL6 were not used any more for new design TVs somewhere around 1975 or so. But indeed, the TV replacement market was huge. A color TV used three of them. So the replacement market was accordingly large. One way or another, millions of 6FL6 are stored on boxes, barns, garages and other places. From this, some small supply of 6FL6 will always pop up. Probably small quantities, but it will occur very often. Just because they were made in such massive quantity. The situation would be totally another if we would be talking about a tube of which few were made ever since, and now everybody wants it. Like Telefunken ECC803S. That is very difficult of course, but with 6FL6 it is really the opposite. In addition, there is also the possibility some industry stock pops up, and then for a while there will be many for sale. About EL509:Theoretically it could replace 6LF6, but he EL509 market consists mainly of fakes. The Russian ones can do only 0.5 Ampere, which doesn't even come near to 6LF6. The now obsolete EI tubes do better on peak current, but they have a failure rate in the Futterman which is said to be 40%. The problem of the JJ EL509 is, they are made by JJ. So I would recommend Futterman owners, not to modify their amplifiers for EL509, unless you know REALLY what you are doing. Better pick 6FL6 from Ebay as they come, until you have 20 pcs of one brand, match them, and sell the rest on Ebay again. Every man needs a Mt. Everest to test the mettle of his soul, and as soon as the NYAL team had perfected the Futterman circuit, we needed to get higher….because once we heard this circuit with a regulated power supply, we knew had to take up the challenge. Let me not be modest about this challenge. No other company in the history of the audio arts, that I am aware ever dares to design both a high voltage (350 volts) and high current (10 amps) power supply before or since. The OTL had TWO 5,000 watt regulated power supplies…which are testament to Ted Hamond's engineering genius. At the time this was the most complex, most expensive ($12,000 in 1984) heaviest and most complex tube amplifier and OTL amplifier ever built, and explains why I understand the meaning of complexity, and the value of simplicity. This amplifier caused quite a stir in Japan and in 1984 Japan's Stereophile Magazine gave it an award. Now you know why I have such a short fuse when I here tube amplifier manufacturers whine that designing regulated power supplies are too hard. Both the OTL-1 and OTL-3 were rated at 90 watts into 8 ohms, but the OTL-1 sounded like it had twice the power. I used two pairs of OTL-1 on my West Electrostatic monitors. An interesting note: I was the first to start using retro-meters in America, and others soon followed…and the meters cost me $55 each. This was the most popular model and consisted of two mono amplifiers. Quad 63 owners loved them. Each amplifier had their own built in fans to keep them cool, and if used properly would give years of trouble free use. 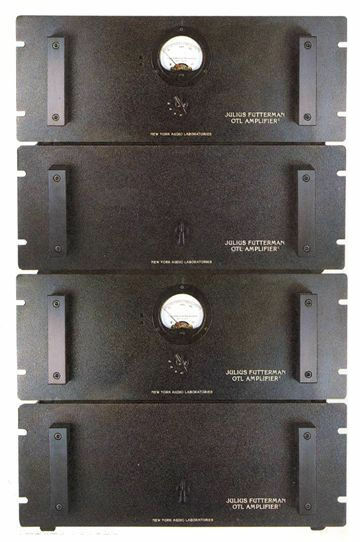 I am aware that many of the original OTL-3 owners are still using their amplifiers with original tubes…and that is fifteen years of ecstasy, because they used these amplifiers properly. On the other hand musicmaniacs would here these amps on Quad 63s and then used them on their Acoustat Monitors, where were very inefficient, 2 ohm speakers…which I advised against…and then I would get a call from and OTL-3 owner complaining that after only two months his amplifiers sounded distorted. As I suspected the output tubes were exhausted, and for good reason. The rumors started by the mealy minded that the Futterman amplifiers were unreliable arose because these thermionic feeble never understood that OTL amplifiers can only be used with a very limited range of loudspeakers…and be reliable. 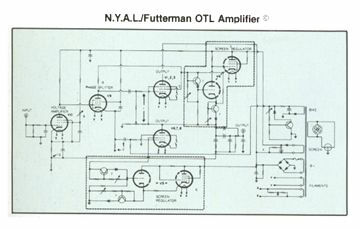 It is understandable that so many would try to use OTL amplifiers…because they sound so good…but the reason OTLs are not more popular is because they have been abused, and been given a bad rap. My warning about the proper use of OTL amplifiers is wire other OTL manufactures want me taken for a long walk on a short peer. My invitations to debate them on this subject, are unanswered. These are the Wima caps from NYAL from 1983. As you know, Jim Jackson and I were there from before the official company's inception (Tube God) till the demise of the NYAL company itself. I was there at 72nd street when the building of the H3AA was being done and where Julius was working with his brother-in-law and a young Doug Cassara. I purchased the last H3aa that Julius built before turning the company over to Harvey. I later sold NYAL amps for a company on 5th Ave directly under a then fledgling business named 'Hugo Boss'. I've probably forgotten some of the details here in that time period. Some of it is starting to come back and Jim Jackson could probably fill in the blanks. 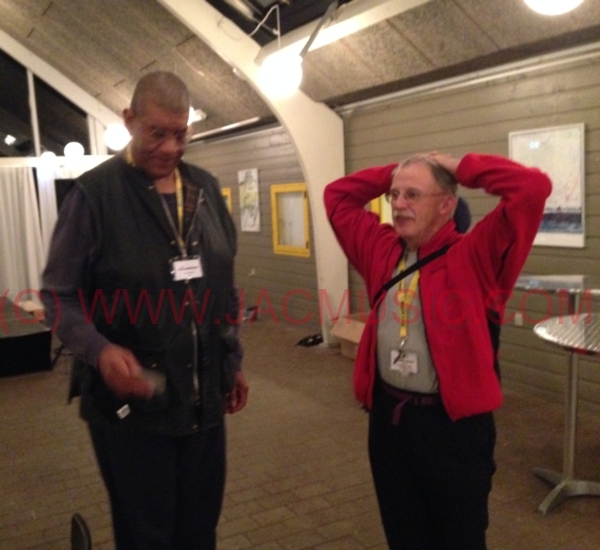 At the 2017 European Triode Festival, by total surprise, I met one of the 'New York Audio Labs' (NYAL) key partners of Harvey Rosenberg. In the morning we had breakfast at the same table, and I didn't even know who he was. What a crazy coincidence. We just talked about tubes, and suddenly he mentioned his work at New York Audio Labs, and I said hold on.... then you must have known Harvey Rosenberg and Julius Futterman? Well of course he did! His name is Jon Syder, he is a brilliant electronics designer, the first chief engineer at NYAL, later followed up by Ted Hammond and George Kaye. Jon is the person on the right. He was many times at what was called the 'shop' of Julius Futterman, and he knows a lot about it still. Actually John told me, this was not so much of a shop at all. The transformers were made just in Julius' private apartment in New York, where he lived with his wife. Julius famous pressure pot, for many years owned as a memory by Ted Hammond. Jon told me the pressure cooker was used only to boil them in shellac, not to actually pressure cook them. It was just from his kitchen. Interesting to hear that first hand, 25 years after! Jon Syder left the New York audio scene and later studied biology in California and Alaska. He works now for the government in Anchorage, Alaska, and he loves the pioneer way of living over there. He told me you can just DO things over there, which are impossible elsewhere. He told me, the way of living in Alaska is so free, and wonderful, he intends to stay there as long as his bones can deal with the cold over there. This pot was used for potting the transformers. The rumors that Julius' ashes are in this pot, are not true. This pot was stored for many years at a ship yard, where Ted Hammond had a workshop. Picture and the following text with friendly permission of Harvey Rosenberg. .... As you approached Julius Futterman's shop on the second floor of a building on the corner of 72nd street and Broadway in New York City, you began to smell a very nasty odor. The smell of burning shellac. 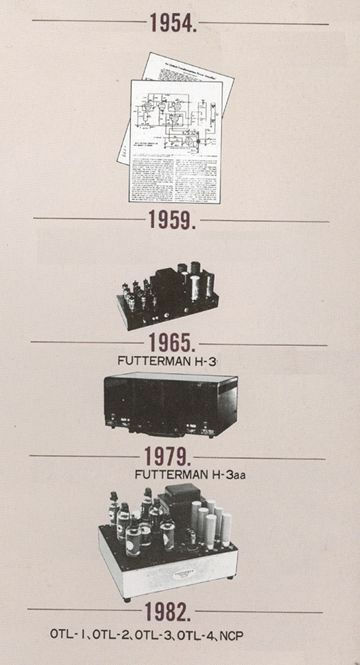 Futterman wound his own power transformers because he believed that no commercial winder could duplicate his design. OTL AMPLIFIERS NEED VERY SPECIAL POWER TRANSFORMERS. After he wound his transformers he would put them into this pressure cooker pot that his wife gave him and put it on hot plate and cook it for a few hours and as you can see some of the shellac dripped over the side and on to the hot plate and burned. 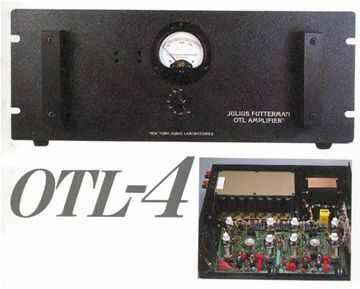 Next to the Futterman pot is the first commercial OTL amplifier every made, the H1; it is Julius's personal amplifier that he gave me. I recently repaired it and listened to it. This tiny 15 watt mono OTL amplifier is the MOTHER OF ALL OTL's. This little amplifier is the OTL BIG BANG. 1981 Audio Engineering Society Fellowship award for Julius Futterman's work. 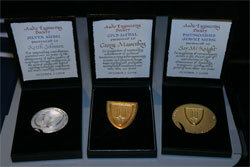 The AES awards are given since 1949 until today, to a members who has rendered conspicuous service or is recognized to have made a valuable contribution to the advancement in or dissemination of knowledge of audio engineering or in the promotion of its application in practice. Unfortunately Julius died before the award could be given to him, so the AES decided to honour him Posthum with the award. I read somewhere, they dedicated an empty seat to him, that day. I see some some names on this list I recognise, like Lansing, Frank McIntosh (for the Citation Amplifier) Bode (who made the Diagrams), Klipsch, Baxandal (Tone control) and even Lee de Forest, are named in one list with Julius Futterman.